During the eighteenth century, salmon fisheries established at the mouth of the river were tended to with rodneys and punt, but these boats were not suitable for the rapids and shallow waters upriver. By the twentieth century, Gander Bay boat builders were building “double-enders” modeled on birch bark and cedar canoes used by Mi’kmaw on the Gander River. 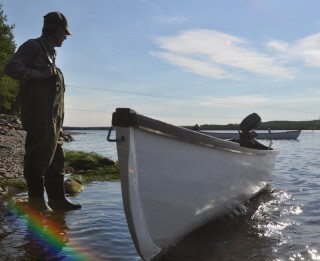 “The resulting hybrid was stronger than a cedar canoe, yet nimbler than a rodney,” says Gary L. Saunders in his book Rattles and Steadies: Memoir of a Gander River man, “Approximately five metres long and just under a metre wide, it was planked with thin fir strakes nailed edge to edge on sawn spruce timbers” (Saunders 2003). The two-day trip from Gander Bay to Glenwood could be done in six to seven hours with a motor, but they were not common on the river until the 1940s. While the first outboard motors became available in Newfoundland in the mid-1920s, they were not immediately compatible with the double-ended boats. Willy John Torraville, Nat Gillingham and other local builders began to experiment with design. First, the double-ender needed a stern to attach the motor. To remain efficient in shallow water, the canoe shape was kept below the waterline and tapered into an inverted triangle transom. 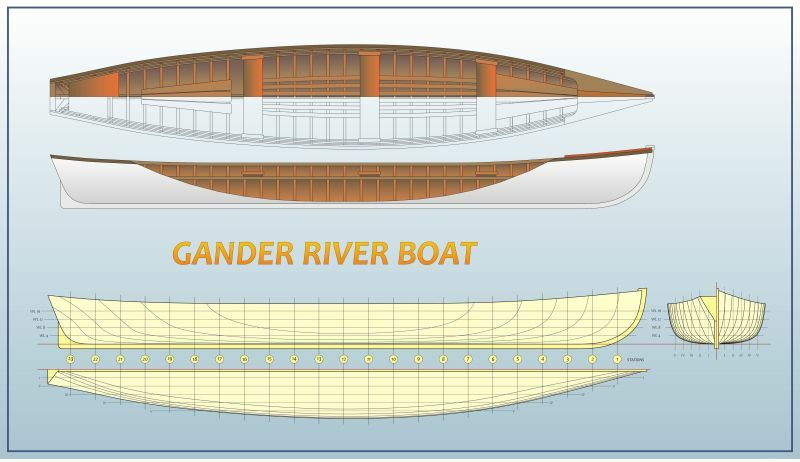 Local builders now agree that the ideal length for a Gander River Boat is 24-25 feet, “any longer than that the boat gets hard to handle and smaller boats can’t carry as much,” says retired river guide and boat builder Lester Vivian. “I think everyone agrees that’s about the right length,” Ern Hodder confirms. At midship, these boats range in width from 45-53 inches on average – a matter of preference in the negotiation of stability and manoeuvrability. The spruce timbers used in the first double-enders have been replaced by juniper ribs and planks are now made of spruce since invasive insects have damaged local fir trees. Today, wooden Gander River Boats are increasingly being replaced by fiberglass. Only a handful of builders in the area, including Basil Gillingham, Lester Vivian, and Eugene Saunders, can still be found building with wood. In the mid 1970’s, five fibreglass mini riverboats were constructed in Gander. Gary Webb provided his garage to build a form for the canoes which were 16 feet in length, 16 inches deep, inverted triangular transom and 40 inches wide, with 3 coats of fibreglass cloth and resin. A thick fibreglass skeg ran under the bow and full length of the bottom protecting it from rocks and giving some steerage way. Large spoon paddles were used by the stern paddler to manoeuver on the river currents. 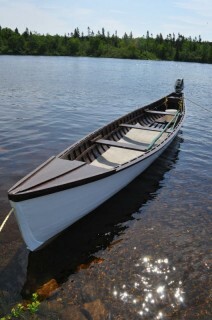 They were used as freighter canoes mostly on the upper Gander River for 3 -4 day river trips. Four HP Mercury outboard motors would provide the HP need to push a full load up the river or across Gander Lake. One disadvantage was the weight of 130 lbs. but still a great method of fishing or moose hunting. “Mini” riverboats? Just what was the intention behind making these boats smaller? Traditional builders are in agreement that 25′ is optimal so who thought reducing the length would be an improvement? Can anyone tell me where you could buy a new Gander River Boat. Platinum builders out of glenwood.